Out of billions of pages on the Web, for the moment, you have chosen to read this one.................. Congratulations!!! It is difficult to define Hinduism precisely. Hinduism is all encompassing and very dynamic. Yet, I will make an attempt to explain Hinduism for the benefit of those who are curious to know about it. Hinduism is a ‘’Dharma” and not a religion. In fact, there is no word equivalent of “religion” in the Indian tradition. The word Dharma would correspond to “righteous path” in English language. Hence anyone with a righteous conduct can be defined as a Hindu. Thus a good Muslim or a good Christian would also qualify to be a good Hindu. What to say of a Muslim or a Christian, even an atheist with righteous conduct would be a good Hindu. Yes, even atheism can be accepted as a valid path under Hinduism. In fact one of the six schools of Hindu philosophy (Samkhya Shastra) deals with the atheistic world view. Thus there is no concept of a believer or non-believer and everyone is equal in the eyes of a Hindu. Hinduism prescribes us to be non-discriminatory (samadarshi) in the way we perceive all living beings irrespective of their personal qualities, belief system, value system etc. This is because we must see every living being as the manifestation of the same Supreme-being. Hence a thief has to be dealt with the same way as we may deal with a virtuous man. Does that mean we should not condemn the evil? Here we must distinguish between the action and the actor. We must condemn the evil actions but not the evil doer. If we hate the evil doer we will ourselves bear the consequences of that negative sentiment. 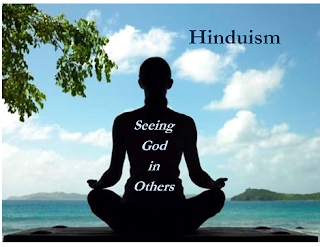 The essence of Hinduism revolves around a few key concepts. One of them is the concept of Karma and the cycle of life and death. Karma is the consequence of an action that may become due. The accumulated Karma is the sum total of the due Karma of all our actions in all past and present lives. The ups and downs of our lives are the result of our accumulated Karma. The life in Human form presents an excellent opportunity to neutralize our accumulated Karma by pro-actively engaging in righteous deeds. Another concept is that we are not a body but a soul. The body keeps changing from the childhood to old age. The body is material and that material keeps changing every moment. When you eat a fruit, the material which was body of the plant, after absorption through the digestive system becomes your body. When you exhale molecules of carbon dioxide and those carbon dioxide molecules are absorbed by the tree in your garden, essentially a part of your body becomes body of the tree. Thus we are exchanging our bodies with various living beings in our surroundings. Hence you are not a body but something else and that is what we call a soul. Soul is what you are and that same soul on death migrates to another body. Depending on our karma, we may acquire any type of body a man, a woman, an animal or even a plant. Through this cycle of life and death and soul migration, we keep shedding our accumulated Karma and gradually rediscover our divine character. How the soul has a divine character? As a glass of ocean water has all the qualities of the water inside the ocean, the soul has all the qualities of God and thus divine. The purpose of life is to discover this divinity through righteous deeds and spiritual evolution techniques. It is like refining a raw material in a factory by making it go through various refining operations till you obtain 100% pure product. After going through various cycles of life and death and performing righteous deeds, the soul gradually achieves more and more refinement till it becomes like God and ultimately succeeds in uniting with the God and thus attains a state of ultimate bliss. That union with God is our ultimate goal and the only purpose of life. How do we expedite the process of refinement of soul towards divinity? There are many techniques towards that end including Ashtang Yoga, Meditation, Pranayam, Nama Japa (chanting the holy names of the Lord), Mantra Japa (chanting a sacred Mantra), Satsang (communion with enlightened beings), Swadhyaya (reading holy scriptures) etc. However, the repository of techniques for spiritual elevation are not limited and new techniques are being added to the list every now and then. This is because Hinduism is an open source platform (like Linux) and any enlightened person is free to add to the body of knowledge. Thus if after years of sadhana (spiritual rigour), you become enlightened enough to prescribe your own method for spiritual development for your disciples, you may establish your own sect within the umbrella of Hinduism. Thus there are multiple sects with multiple models for explaining the phenomena of existence. Most of these can be categorized into three categories: (a) Advaita (non-duality) (b) Dvaita (duality) (c) Vishishtadvaita (qualified non-duality). The Advaita model prescribes that the creator is not separate from the creation. The Dvaita model prescribes that the God and the Universe have separate existence. The Vishishtadvaita model sees the Supreme-being as an eternal oneness, but also as the source of all creation, which is omnipresent and actively involved in existence. There are many schools of philosophy developed around these three models of which six (Samkhya, Yoga, Vaisheshika, Nyaya, Mimansa and Vedanta) are main. (Google: Hindu Philosophy). That is philosophy. Don’t Hindus worship God? Of course they do. The God for Hindus may be a formless being or also having a form. The formless God can be worshipped by performing Yajna (fire sacrifice) or Mantra Japa (Chanting a sacred mantra) or saying a prayer. The God with a form can be worshipped as a deity in a temple or as an image at home by offering flowers, incense or sweets etc. Singing devotional songs and dancing is also a popular mode of worship. The ISKCON is best known for this kind of worship. But that is idolatry. How can you worship an idol or something you make with your own hands? Well, Hindus don’t worship the idol but use the idol as a medium to focus on the God. The God is omnipotent. Therefore, he can be formless and also acquire a form at will. When we offer our prayers before an idol, we are communicating with the omnipotent Supreme-being using the idol as a medium. After all, the God is present everywhere. So, why not inside an idol? God does not care how we worship Him. He only cares for our love and our emotions. He is omniscient and therefore he knows what is there inside our hearts. Thus there are many modes of worship in Hinduism. Everyone is free to choose his preferred mode of worship as per his liking, philosophical inclination and intelligence. This world is plural in nature with people of different intelligence, different spiritual enlightenment and different emotional disposition. Therefore Hinduism allows plurality in modes of worship. Various modes of worship can be categorized mainly into two categories: the Gyan Marg (the path of rational contemplation) and the Bhakti Marg (the path of absolute devotion). The Arya Samaj is an example of the Gyan Marg and ISKCON is an example for the Bhakti Marg. What about scriptures? Which scriptures are sacred to the Hindus? The four Vedas (Rigveda, Samaveda, Yajurveda, Atharveda) are the foundation of Hinduism and it is believed that the Vedas were revealed to various seers more than 5000 years back and have been preserved since then by memorization and recitation. But Vedas are difficult to comprehend for the uninitiated. Therefore the Vedic concepts have been explained through the Upanishads (108 in number) by way of discussion between the spiritual teachers and disciples in the form of questions and answers. The Upanishads contemplate about the nature and qualities of the God, the nature of Soul, nature of this creation and the relationship between the God and the Soul etc. Two important epics Ramayana and Mahabharata and also the eighteen Puranas explain various facets of theology and philosophy through various stories. These scriptures are important but a Hindu is not bound by what is written in scriptures. He is free to question what is written in scriptures and reject whatever does not seem reasonable to him. There is no concept of blasphemy in Hinduism. "The Bhagvadgita is perhaps the loftiest and deepest thing that the world has to show"
In this world, characterized by religious hatred and violence, Hinduism gives a hope to mankind.